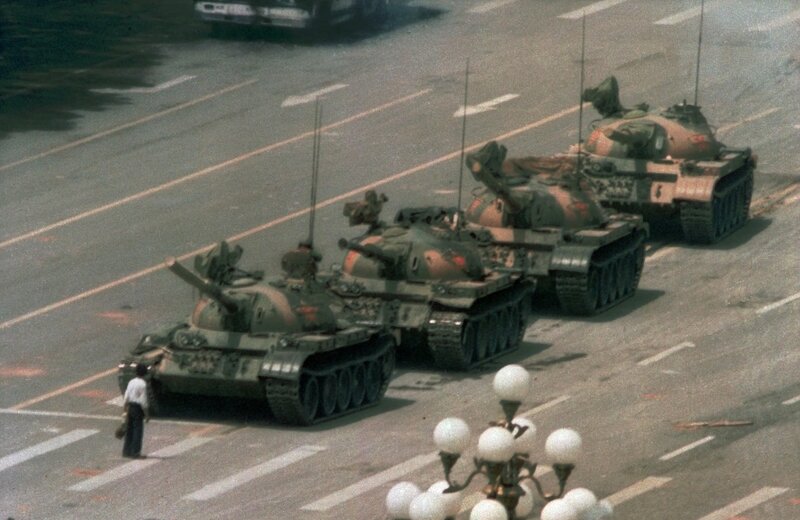 A couple of years ago, I scoured the Internet for not only all of the photographs taken of the Tiananmen Square Tank Man, but also the highest quality photographs of each, as a way to ensure no individual, organization, or government can deny it ever happened. Here I present and provide all six of them, with stories from each photographer. Why? Because I can. I’ve ordered the photos below in (what I think to be roughly) chronological order of what may have been a total of unforgettable 2 minutes in history. Each is labelled by photographer and image resolution. Click on each to view the full resolution. Download the .ZIP file (7 MB) with all of the below images. Imgur album with all the below images. 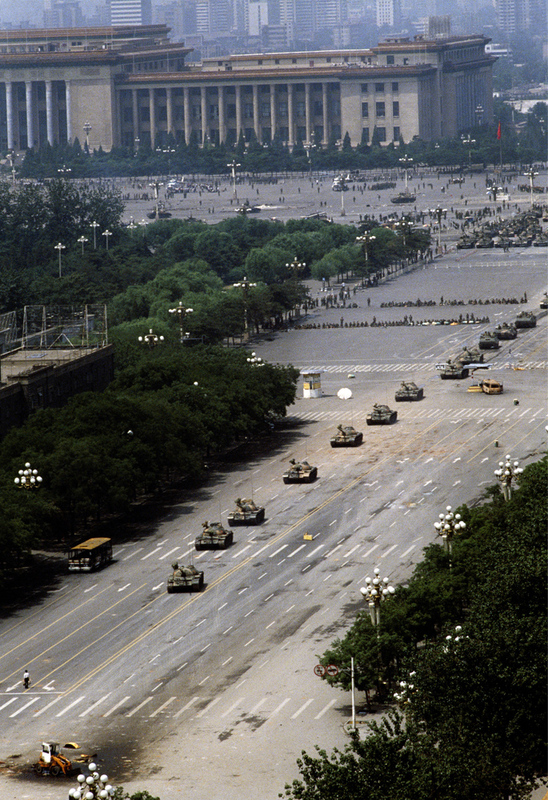 I took the photo on June 5, 1989, as a reporter for The Associated Press covering the Tiananmen Square protests and military crackdown on protesters in Beijing. 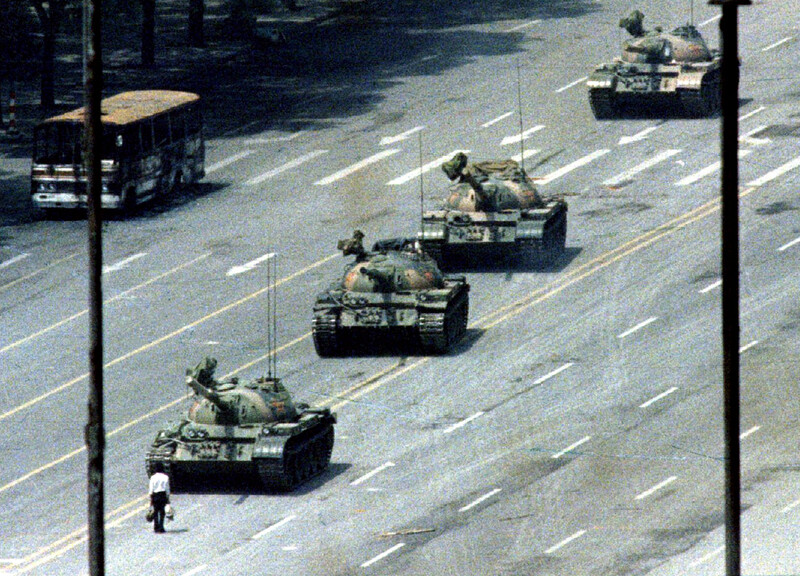 It’s a shot of the man who had the famous confrontation with the line of Chinese army tanks, a different angle of the well-known image that we’ve all seen of Man vs. Tank. That photo—actually photos, since the same scene was captured by four different photographers from essentially the same location atop the Beijing Hotel—has become a symbol around the world of democracy movements, people power and photojournalism itself. I was standing at the front of the Beijing Hotel around lunchtime when I heard shots emanating from the direction of the square a couple of hundred meters to the west. People were running east toward me. I could hear the grinding motors of tanks not far down the road and more shots coming from that direction. 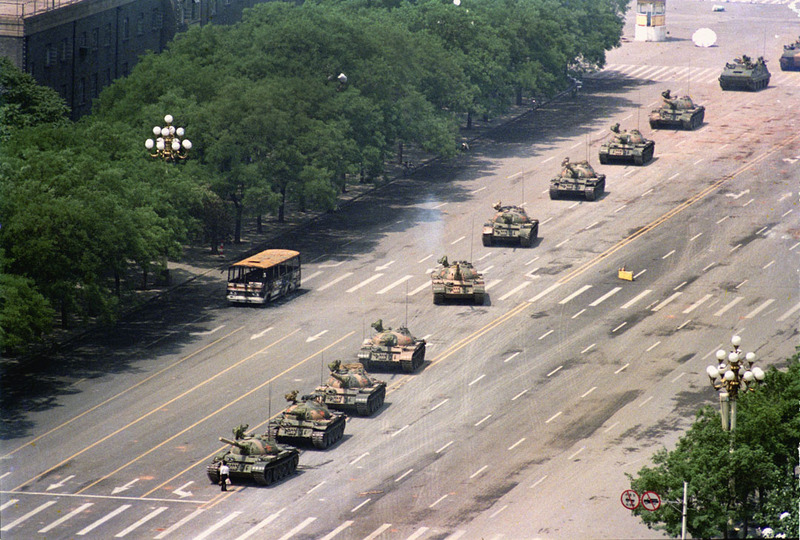 I raised my Nikon F-801 SLR camera and squeezed off a single shot of a column of tanks I could see approaching from the right, then I ducked down a side street and into an entrance to the Beijing Hotel where I was staying. Gun shots can be heard coming in from east and west. I felt unsafe going back to the square where the students stayed, so I went up to the 11th floor of the Beijing Hotel, where some of my press friends stayed. 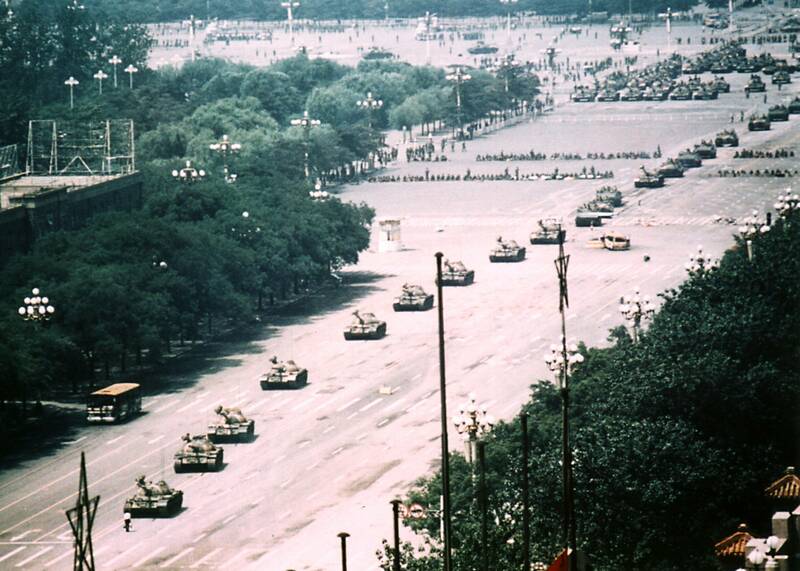 The square was clear but by now there were more than 100 tanks assembled. We watched people protesting near the hotel. Troops opened fire and killed many of them. We took pictures from the balcony while, across the street, police watched everything we did. Sometimes bullets hit the hotel rooms when the troops drove past and fired into the sky to scare off people. Rumors went around that they were going to clear the hotel. Many press people, especially the Chinese, packed up and left. At around noon. we heard the roar of tanks. More than 20 of them, in a big column, pulled out from the square and came our way. I loaded my Nikon F3HP with film and started shooting with a 300mm telephoto lens. 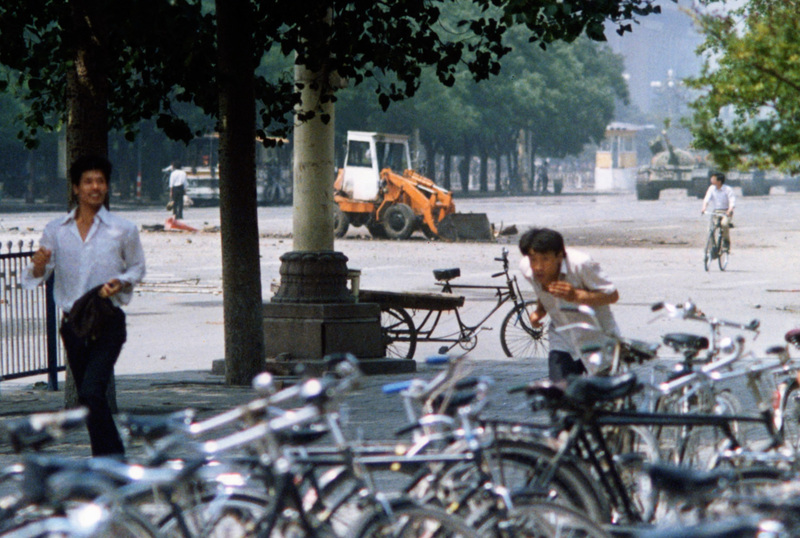 Suddenly one of my friends shouted, “This guy is crazy!” I saw from the viewfinder a man carrying two plastic shopping bags walk out onto the empty Changan Avenue from the sidewalk, blocking the tanks. The first tank pulled over a little but the man moved in the same direction, preventing it from advancing. I put on a 2x teleconverter and took a couple of tighter shots. Then the man climbed up the first tank and tried to talk to the soliders inside. When he came down, four or five people came out from the sidewalk and pulled him away. He disappeared forever. On the morning of the fifth, we were back on the vantage point of the Beijing Hotel balcony, trying to get a look into what was happening within the square itself. We had not been on the balcony very long when a line of at least 20 Armored Personnel Carriers left the square coming down Changan Avenue. At this point, they opened up on the crowd. I couldn’t tell if they were firing above the crowd or into them, but needless to say, it cleared the streets of the thousand or so persons there. The APC’s continued on down the avenue, followed not long after by the line of tanks. After taking the picture of the showdown, I became concerned about the PSB’s surveillance of our activities on the balcony. I was down to three rolls of film, with two cameras. 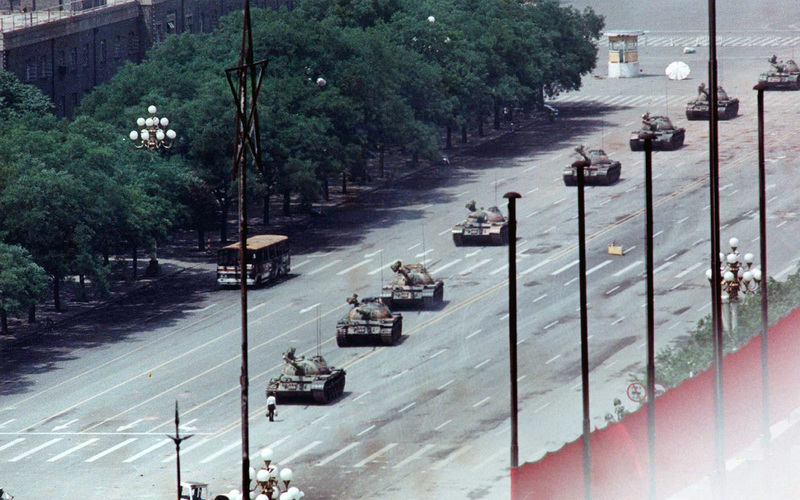 One roll held the tank encounter, while the other had other good pictures of crowd and PLA confrontations and of wounded civilians at a hospital. I replaced the final unexposed roll into the one of the cameras, replacing the tank roll, and reluctantly left the other roll of the wounded in the other camera. I felt that if the PSB searched the room or caught me, they would look even harder if there was no film in the cameras. I then placed the tank roll in a plastic film can and wrapped it in a plastic bag and attached it to the flush chain in the tank of the toilet. I hid my cameras as best I could in the room. Within an hour, the PSB forced their way in and started searching the room. After about five minutes, they discovered the cameras and ripped the film out of each, seemingly satisfied that they had neutralized the coverage. They then forced me to sign a confession that I had been photographing during martial law and confiscated my passport. I loaded the single roll of film in a Nikon FE2 camera body. It was small and had an auto-exposure meter. As I tried to sleep off the massive headache that pounded my head, I could hear the familiar sound of tanks in the distance. I jumped up. Kurt/Kirk followed me to the window. In the distance was a huge column of tanks. It was a very impressive sight. Being the perfectionist that I am, I waited for the exact moment for the shot. Suddenly, some guy in a white shirt runs out in front and I said to Kurt/Kirk, “Damn it — that guy’s going to screw up my composition.” Kurt/Kirk shouted, “They are going to kill him!” I focused my Nikon 400mm 5.6 ED IF lens and waited for the instant he would be shot. But he was not.